We have come full circle with our bi-monthly wine nights with friends. We were back where it started at Dave and Heathers house. Earlier in the day we had stopped at Sunfish Cellars and Chris wanted to pick up a bottle to bring along. We have a very large cellar, but she wanted something young and was looking for something different. As we were browsing, we came across many bottles that were familiar. These included Kunde, Cosentino, Smith Wooten and many more. I recalled that last spring during a visit at our Napa rental house our friends Gary and Suzanne brought over a bottle of Gamling & McDuck Chenin Blanc. It was pretty tasty and with my vague memory, I suggested we try the 2009 Cabernet Franc. We bought the bottle and headed to Dave and Heathers for Wine night with our friends. We were the first to arrive, then Lois and Rich followed by Silvia and Dwayne and it was time for a social hour and a glass of wine! 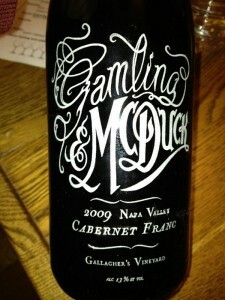 I offered our bottle first, which was the 2009 Gamling and & McDuck Cabernet Franc. Dave pulled the cork and poured us all a glass. Since this was my first time trying this wine I wanted to take some group notes. A light ruby hue and was slightly clear in our glass. Weak, but it did smell young. We noted light red fruit with slight anise to the nose. Medium to light bodied and slightly dry. The tannins were medium and light. 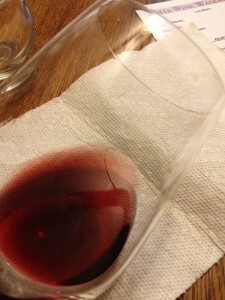 We could taste dark cherry, but overall the Cabernet Franc was light. The finish was medium in length. Overall I think we all were hoping for more. Lois did not even ask for a re-pour. I think for the price (over $35 for the bottle), I was hoping for a great Cabernet Franc. We all rated the Cabernet Franc two glasses.